Submitted by mark on Monday, March 24th, 2014 at 3:37 pm. 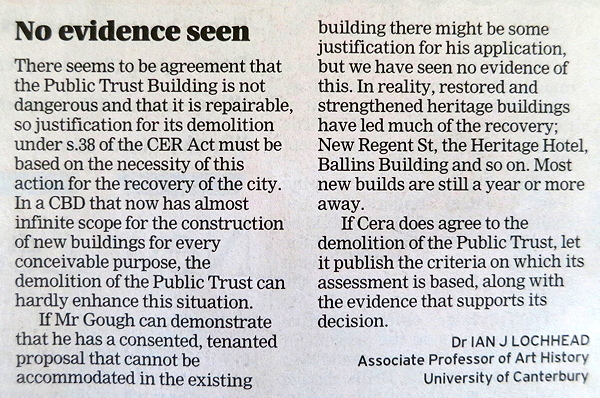 Dr Ian Lochhead has generously supplied us with the text of the IConIC submission. 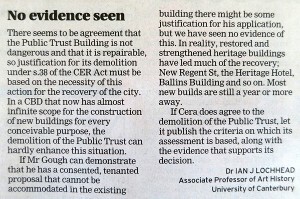 "While it is so self evident that it scarcely deserves comment, the release for consultation of a draft Heritage Building and Places Recovery Programme for Greater Christchurch (HBPRP) over three years after the September 2010 earthquake and nearly three years after the February 2011 quake, is woefully inadequate." Submitted by mark on Friday, February 28th, 2014 at 2:51 pm. Dr. Ian Lochhead has generously provided us with the text of his "Time to Revive the City’s Forgotten Theatre" Op-Ed that was published in The Press. Submitted by mark on Friday, February 14th, 2014 at 5:10 pm. Submitted by mark on Thursday, October 3rd, 2013 at 1:07 pm. Submitted by mark on Wednesday, July 17th, 2013 at 12:27 pm. Submitted by mark on Friday, June 21st, 2013 at 12:11 pm. Dr. Ian Lochhead has generously made available the submitted text for the article "Symbol of great innovation" published in The Press. Note: The text provided by Dr. Lochhead differs slightly from the resulting published article. The article is a response to Minister Brownlee's "Modern city needs new town hall" (Press Online). 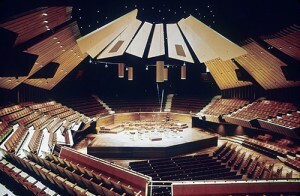 Submitted by mark on Thursday, October 11th, 2012 at 8:51 am. Christchurch City Council passed Councillor Broughton's motion by 5 votes to 4. National Radio's Checkpoint are running the headline "Protestors thrown out of fiery council meeting in Christchurch".